I don't have a cat, but if I did I would purchase the M.A.X. 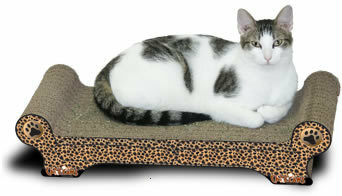 Sofa Scratcher from CatClaws. As a fashion statement, you can't do better than the faux leopard look. The design looks pretty comfortable, too. This cat looks just like my little Rolf from some 30+ years ago. He was a sweetheart.